convincing you you’re only paying with meals instead of the equivalent cost in cash, these services make the food seem cheaper than it actually is. You feel like you’re only paying one or two meal swipes — an arbitrary credit system — when you’re actually forking over $10 or $20 for a snack. When you bought your meal plan, did you sit down and calculate how much each “meal” cost you? FREEDOM. FOR OUR LIVES,” @ living_resource. this. There’s only show that matters, and it is here.” Wale Gates tweeted “#TyrionLannister has the best lines, the best world view and if was real we’ll probably share the same politics,” @ walegates. With Huffman and Loughlin trying for two years in jail instead of 20 years, questions that remain are: What repercussions will be put in place for future cases of fraud? Also, what does this indictment mean to WCU students, and how does this event truly affect college enrollment? Most students at WCU took the SATs and know how stringent the test-taking and application processes are. Students get in by merit, not by bribes. Despite the drawback of the scandal, the main lesson learned from this ordeal is that choices — no matter the individual’s background or status — can affect the outcome of one’s career and personal life. For questions concerning WCU enrollment requirements, check the Office of Admissions located near Sykes or by viewing their website at wcupa. edu. toes on people’s porches in Jackson, Mississippi. It is unclear if anyone has tried eating them. ly attacked his 75-year-old owner, Marvin Hajos. Huffpost reported a cassowary can, “jump nearly seven feet straight up into the air.” The cassowary can also run around 30 miles per hour. school. With the price of college tuition rising each year, less and less students are able to afford the cost. Data from the 2017-2018 school year reports a continued decline in college attendance from students whose families make between $48,000 and $110,000 a year. Varying opinions on the new policy range from worried to supportive of PASSHE’s decision to implement university choice in tuition decisions. In an address to the board of governors on April 4, Dr. Kenneth M.
The National Center for Education Statistics (NCES) currently reports an average of $25,332 for in-state tuition, room and board in Pennsylvania for 2016. Christoforos Sassaris, a third-year student at West Chester University, is a first-generation college student studying English who also has concerns over the new tuition policy. “The way I understand it, if the tuition rates reflect the socioeconomic climate of the area, to me that sounds like West Chester’s price would increase because it’s one of the wealthiest counties in the state,” he said. “The only reason I could afford to go to college was because I happen to live near a school that is unusually cheap for how good it is. The way I understand it, it sounds like this policy could increase the tuition price at West Chester.” For more information on PASSHE’s tuition policy, students can visit PASSHE’s website and read press releases for more information. Dr. Kenneth Mash’s full statement can be found via ASPCUF’s website. Sam Walsh is a third-year student majoring in special education and English. SW850037@wcupa.edu. civilians. 2. Ukraine’s president debates against an empty podium: According to BBC News, Petro Poroshenko, Ukraine’s President, held a debate although his debate partner did not arrive. Poroshenko and rival Volodymyr Zelensky did not agree on a debate date. Zelensky does not engage in traditional campaigning tactics. For example, he has not held rallies or interviews. He mainly uses social media to reach his supporters. wholesale 2 oz. beef burgers sell for around $40.00 for a package of 80. This means that companies like Aramark pay less than $0.50 for a patty that they then sell to students for several times the price they paid. So where is all that money going? Apparently not to its employees. The company advertises their jobs to students around campus, but inside the employment chain, those working aren’t seeing much of the incredible profit Aramark is making. “I make less than $9.00 an hour and have been working here for years,” said an employee. “I’ve received one 25 cent raise from my base pay of $8.50 since I began working.” There are other aspects of the Aramark system that leave students with more meals than they can use, therefore driving up the price per used meal that the student is paying. Most notably, the hours that the most popular and economical dining spot, Lawrence Dining Hall, prevent students with evening classes and obligations from using their meal swipes there. The dining hall closes at 8:00 P.M. on weekdays and 7:00 P.M. on weekends, too early for many students to attend. Even when the dining hall is technically open, the time between the lunch and dinner rush is barren, with limited access to the kind of food that the dining hall advertises. Students can end up with dozens of extra meal swipes because their schedule prevents them from fitting in the strict hours of the dining hall. Even the late night options at Sykes close around 10 P.M., leaving the diner as the only place to spend meals. 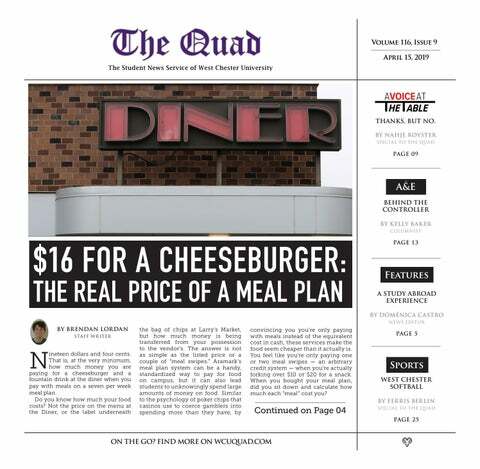 While the food at West Chester may be marketed as a system adaptable to the needs of its students, what is the real cost when the cheapest meal plan may cost the purchaser almost $20 for a late night snack? Brendan Lordan is a second-year student majoring in English writing. BL895080@wcupa.edu. in the presence of wildlife. “I am no more important than the stingrays swimming around in the middle of the ocean,” Gilmore reflected. sounds like when it roars or gotten to look a stingray in the eye,” she said. Gilmore made wonderful memories on both of her study abroad experiences, but if she returned to either location, there are a few things she’d do differently. One of her biggest pieces of advice for those who plan on traveling outside of the country is as follows: “Pack less. Spend less.” Looking back at her trip to South Africa, Gilmore regrets packing a 50-pound suitcase and having to lug it through the airport. After purchasing souvenirs, she returned to the United States with a 70-pound bag. “Bring yourself and some multi-purposed and functional stuff only,” Gilmore advised. She suggests packing carry-on luggage and traveling as light as possible. In addition to packing less, Gilmore also wishes she had talked with more native people in South Africa and “made more lasting connections.” Gilmore advises students to talk to people about paying for study abroad trips. She recommends talking with past alumni who have studied abroad as well as staff members who work for the Center for International Programs. Gilmore ended the interview with the following advice for other West Chester University students, “You’ll never get a chance to study abroad for this cheap or for this amount of time ever again.” She playfully added, “Unless, you know, you hit the lottery or become famous.” Doménica Castro is a third-year student majoring in communication studies with a minor in Spanish.  DC874612@wcupa.edu. This is the fourth article in a recurring column giving students an inside look at what’s happening in each College at WCU, enabling them to better develop their education plans, course selections, and career tracks. etween new programs, class flexibility, international experiences and career development events, the College of Business and Public Management works hard year-round to generate opportunities that facilitate student success. The College of Business and Public Management (CBPM) can be broken down into three main areas of study: business programs, criminal justice and public policy and administration. [This is article one in a recurring column guiding students through the navigation of mental health on college campuses. According to CollegeStats, 50 percent of students rate their mental health as below average or poor, and up to 80 percent of college students share that they feel overwhelmed by their responsibilities. This column aims to assist students in their pursuit of emotional growth.] tress is completely normal, and everyone experiences it. As college students, sometimes stress can become abundant and difficult to manage while we attempt to juggle our responsibilities, especially as we enter the end of the semester. It’s important to learn how to effectively manage stress, because when it becomes too overwhelming, functioning normally can become nearly impossible. The Contemplative Studies Center offers classes in yoga, meditation, Aikido martial arts, mindful art and programs in reading aloud. The Center is committed to having students teach other students methods that they can use every day in order to continue their practice of mindfulness and stress management at home. “One thing that’s interesting about the center is that it is essentially student-run. Students are leading the meditations and leading the yoga, so it’s peer-to-peer rather than some crotchety old man telling them what to do,” says the Contemplative Studies co-director Dr. Donald McCown, PhD. While the Contemplative Studies’ faculty and students offer numerous programs, it might be difficult with such a demanding schedule to set aside time for yoga or meditation. NAMI suggests that simply recognizing the triggers of stress and avoiding them when possible can be extremely helpful. It is also important to prioritize time management and avoid procrastination as much as possible. Often, time limits can be stressful, so keeping a daily planner or journal can allow for stress relief in terms of deadlines. Another proven reduction for stress is eating a balanced diet and exercising as often as you can find time. Healthy eating not only provides balance for your body, but for your mind as well. Fruits and vegetables help stabilize mood, while processed and junk food can lead to a more sluggish feeling. Exercise works in a similar way, as taking part in an enjoyable physical activity can allow for natural stress-relieving hormones in your body to be produced. The Center for Contemplative Studies is open 8 a.m. to 9 p.m. and offers classes as well as free times where anyone can take advantage of the Center, with McCown sharing, “Maybe you just want to come in and take a nap.” For more information on events, visit https://www.wcupa.edu/ healthSciences/contemplativeStudies/ events.aspx. Julianna Eckman is a fourth-year student majoring in English with minors in journalism and psychology.  JE848886@wcupa.edu. “You wished for my life, and in the meantime, brought warmth to me, so I wanted to do the same for you.” motioned towards the mother and daughter. “You wished for my life, and in the meantime, brought warmth to me, so I wanted to do the same for you. No one deserves to feel cold.” Kylie looked at the tree while hugging her mother and mouthed, “Thank you.” Madison Starinieri is a student majoring in English education and special education.  MS882527@wcupa.edu. “College of Business & Public Management” continued. The college’s departments host multiple study abroad trips throughout spring and summer semesters. Since the beginning of the 2019, students in the criminal justice department traveled with faculty and peers to London, management students went to Beijing and geography and planning students experienced Málaga, Spain. As for upcoming trips, the management department will be taking students to China this summer, and the geography and planning department will be taking students to Puerto Rico. student engagement due to their student-focused events, internships and more. Accounting is the leading department in cultivating strong alumni relations. When it comes to preparing students to enter the working world, the departments and faculty within the CBPM organize a multitude of events for students to network and interact with employers and alumni. Aside from the university-wide fall and spring career fairs, the criminal justice department hosts their own job fair and the accounting department hosts a “meet the firms” night in September for accounting, economics and finance students to connect with firms from all over the area. The accounting department also has companies like Kreisher Miller, KPG and PWC visit the business building year-round to set up tables and talk with students. The management department’s senior seminar course hosts a mock interview day where local businesses and WCU alumni practice informal interviews with students and prepare them for the job process. As the semester comes to a close, the CBPM will be hosting its annual scholarship and outstanding student awards night on Friday, April 26, as well as preparing for the Cottrell Entrepreneurship Leadership Center’s business idea and pitch competition on April 17. This year, two teams will be traveling from Beijing University to compete alongside WCU students, faculty, staff, Chester County high school students and Chester County businesses. Ten teams will be competing for prize money to launch their idea and potential startup. For anyone interested in learning about CBPM students and their involvement in real-world professional situations, check out the college’s Instagram to view a campaign conducted by the college’s Communications and Impact Coordinator, Danah Allen, with students to highlight individuals who are doing or have done internships and their perspective on those experiences. Danielle Venino is a fourth-year majoring in communication studies with minors in journalism and media and culture.  DV851965@wcupa.edu. LOGAN RYAN WITH LEO AND JULIUS: ADOPTED 2014 AND 2018. They’re a little bit of a lot of things, but they’re all pure love. et it never be said that comedy is easy, and if anyone says otherwise, they are, unequivocally, a cretin. Almost every comedian from past or present can attest to this, in more or less flattering words. However, it is the opinion of this writer that comedy in the printed word is sometimes even more challenging than simply telling a funny story with the spoken word. Despite this, British-born Australian writer Ben “Yahtzee” Croshaw has made a go of writing comedy books. His self-chosen nickname might be more familiar to avid gamers, as Yahtzee himself is the author behind the popular web-series “Zero Punctuation,” which offers acerbic criticism of the most recent video game releases delivered in a very witty and sarcastic tone every episode. Interested in seeing if his comedy could translate well to the written word, I picked up a copy of his second book, a piece of apocalyptic, speculative fiction: “Jam.” Despite my worries of whether or not Croshaw’s style of comedy would be able to stick, I was relieved to see that not only is the book very funny, but it is also surprisingly disturbing to boot. The premise is centered around protagonist Travis, a native of Brisbane, Australia, who wakes up one morning to see that the whole of the city had been flooded by man-eating strawberry jam. Unfortunately, the reader doesn’t have much time to laugh at the absurdity of this, because only a few pages afterwards, Travis witnesses his roommate being devoured by the red, sticky, carnivorous substance. From April 6 - April 7, over 50 student volunteers came together for a 25-hour gaming charity event to fundraise for the Childrenâ&#x20AC;&#x2122;s Miracle Network Hospitals. As the inaugural Extra Life for the WCU Golden Gamers student organization, and the second Extra Life hosted on campus since 2018, the event raised over $9500 for Penn State Hershey and CHOP. 12 P.M.-Uptown! Mainstage Theater Featuring Simple Things 2:15 P.M.-Uptown! Mainstage Theater Featuring Janek 6:00 P.M.-Uptown! Mainstage Theater Closing Night Party! In my first letter, almost a year ago, I said that I enjoyed dramatic beginnings almost as much as I enjoy dramatic endings. I wrote that line with the assumption that, somehow, we would never reach that ending. Yet, here we are, and it’s time to say good bye. My time with The Quad has been nothing but formative, inspiring and lifechanging. I still haven’t grown accustomed to not using the Oxford Comma, but aside from that, I could not discuss this experience more positively. One of our copy editors, Caroline Fritz, once mentioned the infectiousness (and importance) of mutual enthusiasm. This may be my favorite description of our office: enthusiasm and energy only matched by the passion of our editorial board and staff. Coming to Sunday has been an adventure, a service and a social all in one. I wouldn’t have it any other way, frankly. I wouldn’t trade the diversions into Game of Thrones lore, perfectly mixed with discussions on the future of our campus., for anything. The concoction displays the care these students have for our university. Never forget that you can love a place and still criticize it with the intention of improving it. I would say that I have a great deal of Ram Pride, but this doesn’t have to separate from my desire to see the university better itself each year. This push for change often lies on the shoulders of students. I have been honored to help give these students a platform when they need it. Remember, too, that you don’t have to help others the same way they help you. Olivia Bortner, Domenica Castro, Caroline Fritz and Sunny Morgan are graduating this semester as well. Please send forth your best intentions, as we all jump into the next stage of our journey. Once again, a series of congratulations are in order for Samantha Walsh and Ashley Martindale as they take the mantle of leadership in The Quad’s future. Sam will be announcing the rest of our new staff in the next issue, which I am super excited to see. Onward and outward, West Chester University. Max James Editor-in-Chief SUBMISSIONS POLICY Guest and opinion columns, letters to the editor, political or social commentary, and artwork is accepted during the academic year. All material may be sent to the attention of the editor in chief, The Quad, 253 Sykes Student Union Building, West Chester University, West Chester, Pa. 19383, Material may also be dropped off in our office, Sykes 253 or e-mailed to quadeic@wcupa.edu. An electronic copy of all work is necessary for publication and should be sent to the aforementioned e-mail address. All submissions must include a name and at least two forms of contact information, such as an e-mail address and phone number, for verification purposes. Students should include information such as an on-campus address, class standing, area of study, and/or organizational position. Material is only published if the author/artist can be confirmed as a standing member of the University. Such distinctions include students, staff, faculty, administration, and alumni. We do not accept submissions from members of the community who are not associated with West Chester University. Letters to the editor should not exceed 250 words; columns and commentaries should be between 500 and 1,000 words. All material may be edited to adhere to our policies, AP style, and space restraints. We do not edit for content unless it is libelous, excessively profane, or harmful to a particular individual or group thereof. Opinions expressed within the letters to the editor, columns, and commentaries are those of the author and not necessarily those of The Quad, its editorial board or the student body, faculty, or administration of West Chester University. The deadline for all Op-ed submissons is the Saturday before Monday’s publication by 2 p.m. Copyright ©2018 The Quad. No work herein may be reproduced in any form, in whole or in part, without the written consent of the editor-in-chief. Opinions expressed within the letters to the editor, columns, and commentaries are those of the author and not necessarily those of The Quad, its editorial board or the student body, faculty, or administration of West Chester University. Founded in 1932 as Quad Angles, The Quad was re-named as such in 1975. 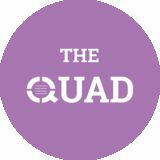 The Quad is the independent, student-run newspaper of West Chester University of Pennsylvania. The Quad is published on 10 Mondays each academic semester and has a weekly newsprint circulation of 3,000. The Quad is funded primarily through advertising sales and, although we receive a budget through SGA and the student activity fee, The Quad is run solely by students and is not edited or altered in any way by University faculty, staff, or administration. The University has no prior review of the content. Rates and mechanical requirements for display advertising can be found on our website at www.wcuquad.com. Inquiries may be placed at the addresses or phone numbers listed above. Classified advertising may be purchased on our website at www.wcuquad.com. The Quad reserves the right to refuse any news items, letters, or advertising thought to be offensive or inappropriate. The Quad exercises care to prevent omissions and factual errors. Corrections for any published error will not exceed the space or prominence of the error that occurred. Claims for adjustment must be made within five days of publication. The Quad is printed by Journal Register Offset in Exton, Pa.
“No, the worst thing that can happen is definitely the realization that you actually hate your major after you’ve already given it what feels like your first-born child and around about a million hours of your life that you’ll never get back, right? Wrong.” about. One of the best resources is the Career Development Center located in Lawrence Hall. This was one of the first places I visited when I was thinking about switching my major. I sat down with someone who helped me to better evaluate my personality and what career fields would be compatible with it. This helped me to take a step back and think about the things that I really wanted and who I am as a person. If the Career Center doesn’t help you, the center for Exploratory Studies will. They have advisors that know all the courses available and can point you in the right general direction. But, make sure you make an appointment ahead of time; they are very busy! And there’s a reason for that, which brings me to my third point - you are not alone! Another point that I literally cannot stress enough is that while it may feel like everyone has it together and is on the straight and narrow, the truth is they don’t. There’s no way they could. College is about learning, growing as a person and discovering who you are. The movement for free college is dead,” expensively educated and out-of-touch pundits announce. Dead? When students at 17 and 18 must ask their families to take a heavy financial burden, beg and scrape for scholarships and grants or commit themselves to pay hundreds of dollars monthly for decades? Often two of these, or all three! This difficulty is compounded by the economy many students expect to graduate into: one of casual work, scarce full-time work and high rent. How can a movement die when debt and rent conspire to eat all your monthly income? And yet, some have chosen to celebrate the end of a movement while the problem it aims to solve only grows, much like the interest which one must pay off for years before they even touch what they actually borrowed. Someone has to stop the scrooges. If debt dies anywhere, it certainly will not be here in Pennsylvania, which ranks highest in national student debt. Ask your professors, and even the ones who aren’t adjuncts, that paid pennies for a class have crippling levels of student debt. Each tuition hike is a future income loss for current students. Hours of your life you have to work. Each raise in interest rates is additional years of payment. The movement for free college is allegedly dead, and yet the debt continues to impact so much of our life. When students shop around for universities to attend, they not only have to worry about where they are accepted based on their “merit,” or what program fits their needs/interest; they most often must also consider price. After students graduate, they must begin loan payments, which often determines the trajectory and pace of the rest of their lives. There is hope, however, of moving towards free college. ASK ALI: BODY PRESSURE Again, this concept can sound somewhat depressing; however, this ideology is a situation in which the cliche, “the grass is always greener,” truly applies. Everyone wants what they don’t have – even when what they have is equally as beautiful and special. rant about how unhealthy it is for everyone to want to alter the body they were given, because we’ve all been told that before, too. However, I do wish to point out one thing in hopes that it will show just how stupid this whole concept really is. No one is ever content. This sounds super bleak and miserable, but in a way, it provides me with a great deal of comfort. There are women who see themselves as bigger, and wish to be thin. I have been thin all my life and have always recognized the pressure that is put on me to be bigger. There is no winning. he month of March was a big one for the Rams as they went 13-5. The Rams ended the month by sweeping the Lock Haven Eagles 4-0 and averaging seven runs a game. The team looked to keep this success rolling as they looked over their schedule from this month. The month of April is packed with tough matchups as the Rams will face four PSAC teams. The Rams first matchup was against the East Stroudsburg University (ESU) Warriors. Their doubleheader weekend started at Serpico Stadium on April 6 with a 1:00 P.M. start time. Although a rough start to the game, West Chester went into the bottom of the second down 4-0, hoping to get some runs on the board. With a walk, single and a pair of outs, the Rams left their lead off man with two on and two outs. With sophomore Justin Horn at the plate, the Rams looked to rally. Horn delivered with a two run double. Following Horn, Kyle Feaster singled, allowing the Rams to tally one more run before the end of the inning. Although the Rams were able to pull ahead at the bottom of the third, they were unable to keep their lead. The Warriors took both wins on the day as well as their first match Sunday, leaving the Rams 0-3 to start. The second Sunday matchup was a different story for West Chester. The game was scoreless until the third inning when Feaster knocked in Horn with an RBI double. The bottom of the fifth was a big inning for the ESU Warriors, as they scored three runs that brought them to a 5-3 lead. The Rams were able to regain the lead in the top of the sixth with a grand slam from Horn. The Rams tallied on two more runs before the game ended. also scored to end the inning Rams ahead 3-1. The next inning Hansen came up big with a two-run RBI single to yet again bring the Rams ahead at 5-1. The Rams scoring-streak ended at the bottom of the sixth with a three run triple from senior Joe Zirolli. The Rams ended their weekend battle with a 8-1 win against the Raiders. The Rams will travel to Philadelphia to face Chestnut Hill College this Thursday. A four game series with the Millersville Marauders will follow. Jordan Zimmerman is a second-year student with an undeclared major.  JZ885480@wcupa.edu. so that needs to be Philadelphia’s main focus on both ends of the floor. As long as Embiid is on the court covering the paint, the Sixers should be able to win the rebound game. Essentially, it comes down to limiting Brooklyn’s high percentage looks from beyond the arc and getting rebounds to limit second chance opportunities. Philadelphia has plenty of weapons who are capable of scoring and going toe-to-toe with the Nets offensively, but without Embiid’s defense and the 30 point average he has against the Nets, this could be a tough series for the Sixers. My prediction is Sixers win the series 4-2, and a majority of the games are close, high scoring contests. Andrew Heller is a second-year graduate student majoring in English.  AH804286@wcupa.edu. PSAC) as they rolled to a 6-0 game one victory before using a 10-run seventh inning to earn the game two victory by a final score of 13-3. And, of course, this past Saturday, the Golden Rams split their doubleheader with Kutztown as West Chester dropped game one 9-5 before rebounding to capture the second game 2-0. The Golden Rams’ next matchup will take place next Friday, April 19 at home against East Stroudsburg. in finance and economics with a minor in journalism.  FB845767@wcupa.edu. Dwayne Wade and Lebron James, along with Chris Bosh formed one of the greatest super teams of the modern era. A total of four finals appearances, two championships. Houston Rockets vs. Dallas Mavericks by Danny Bollinger/NBAE via Getty Images Dirk Nowitzki retires as one of the all-time greats to ever play basketball. He put on one of the classic finals performances when he took down the “Big 3” in Miami. Dirk is also the sixth place all-time scorer. ends of their time retire, like Larry Bird or Magic Johnson. As time continues to evolve and shape the league into new heights, new legends will be born. Ultimately, this will just continue on to our sons and daughters who look up to future legends who are just rookies and two year players now, or not even in the league yet today. But, it still hurts to see legends of each generation retire and move on from the sport that made them into such star-caliber athletes. I know all NBA fans out there will see the coming retirement of Lebron James as a true end of the 2000s eras of basketball, considering Wade and Nowitzki just retired, leaving only Tony Parker and James remaining from that time. As new players enter the league and the old generation fades into time, we’ll see the legacy of players like Dirk and Wade be immortalized into their respective franchises history. As Mavericks owner Mark Cuban stated in Nowitzki’s postgame retirement ceremony on April 9, “I’ll promise you that you have a job for life, I don’t care what you do.” Cuban also later promised that he’d retire his number and put a statue outside American Airlines Center, where the Mavericks play. Dwayne Wade has also cemented himself in the Miami-Dade County community, where he is beloved by the fans and people all around southern Florida alike, so he decided to leave them with a goodbye message after the Heat’s win over the 76ers in his final home game. Wade got on the microphone and stated, “I’m sitting here, the most thankful person in this state. To play my last game on this floor, I’m not crying on the outside right now because I am so joyous, but this is going to take some getting used to. It’s simple as this, Wade County, I love you.” This may be a sad moment to see two legends fade into history, but ultimately, this just sets up the future of the NBA and cements the greater legacy of the past. Jeffrey Babcock is a second-year student majoring in Communications.  JB884128@wcupa.edu. you go to bed can keep you awake longer. You can keep a sleep log so you can track the time you go to bed and when you wake up. This way, you can figure out what works best for your sleep and make the changes needed to improve it. During finals week, the best way to prepare yourself for exams is to study and get work done during the day. That way your body can be well-rested and ready to take on the end of the semester. Sean Laughlin is a third-year student majoring in communication studies.  SL918690@wcupa.edu. Meghan O’Mara (Sayville, N.Y./Sayville) tied for first in the Kutztown Spring Invitational on Sunday afternoon signing for a 76, which in conjunction with solid rounds from her teammates was enough to lift West Chester to its seventh consecutive Tournament victory in the 2018-19 season. As a team, West Chester shot 328, which easily outdistanced host Kutztown who recorded a 366 to finish in second place. West Chester will be back in action on Monday and Tuesday afternoons as the Golden Rams are set to host the Dr. Edwin B. Cottrell Invitational at Penn Oaks. Ralph Casper (York, Pa./York Suburban) had a solid weekend for West Chester competing in the Bill Butler Invitational as he recorded three victories as he took the discus, hammer, and shot put titles in what was a solid performance for the sophomore. In the shot put, Casper registered a mark of 54 feet 3 ¼ inches, which stands as both a PSAC Qualifying standard and an NCAA Division II Provisional qualifying. Meanwhile, Casper also recorded PSAC Qualifying standards in both the discus and hammer throw as he recorded a mark of 160-8 in the discus and 168-3 in the hammer throw. Chester in the match, which no other team was able to do during the tournament. The Bonnies scored first and led 5-0 after two minutes. WCU fought right back with a try by Moritz and two trys by Czaplicki to put WCU in front at the half 19-5. WCU was able to score one more time in the second half to seal the tournament championship with a 24-5 victory.